Usually, we spend most of our time outdoors, but with the never-ending rain during our Holiday weekend, we had to settle for a visit to the Main Street Theatre, the Palace. Our first time, there. The Palace is the jewel of Main Street. The marquee lights illuminate the friendly space below, where there are always a few people looking at the posters. It’s such a great theater, as we used to have before the current multiplexes took over. Compared to these huge movie chains, this place is a breath of fresh air. The tickets are affordable (7 dollars) and sodas, candy and pop corn are all within a couple of bucks. 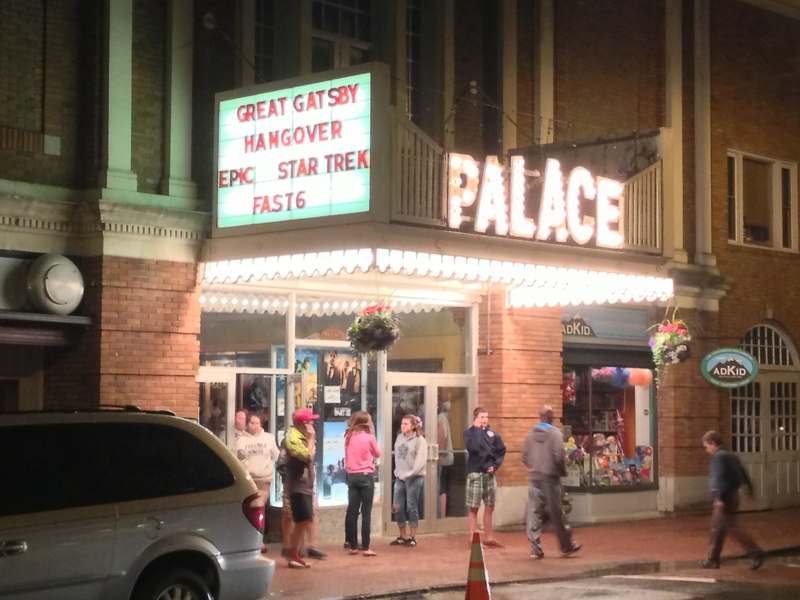 The Palace, but also a few more in the North Country, is one of small-town theaters vital to keeping downtowns alive. ANCA and the Adirondack Film Society are working to make sure they don’t go dark. Working with 10 theaters across Northern New York, the “Go Digital or Go Dark” campaign is raising money for each theater to complete needed digital upgrade work this summer. This is a one-time campaign to save these theaters from shutting their doors. Click here to watch a short video that was made to illustrate the need of this campaign. To support the campaign and donate, go here. As for the movie, you ask? Well, a lot of fun and action. What else to expect from Fast 6? Wherever you go, around Lake Placid, there will always be THE views! But the one I prefer is just outside the town limits, after the ski jumps towards Keene on Route 73. I stopped there for a few minutes, just watching Marcy, Caulden and Algonquin under a cloudy, albeit sunny, sky. After a long day hiking, it’s been one of our pleasures to go enjoy our Chai Teas at Coff E Bean on Main Street in Lake Placid. Inside the Lake Placid mall, this small café is wonderfully atmospheric, with a balcony overlooking the lake. It seats only a few but the views are magnificent. Locally owned, with a great barista knowledgeable of the area. Fantastic banana bread pudding and various muffins complete the selection of coffees. No fast food, but definitely food fast. Why go anywhere else?